For a limited time, Quick Business Manager Standard Edition, will be offered for a special of only $195 for a limited time for this version! Click here to order now! * Export Invoices, Quotes, Orders, Bills, and any other documents to Microsoft Excel. 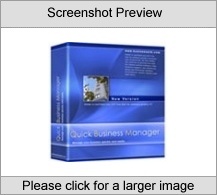 - Multi-Tier: Quick Business Manager is an enterprise business manager that is divided into four logical layers or tiers. As a result of its design a business can deploy the application in a variety of distributed and non-distributed configurations. - Very user friendly: Intuitive user interface makes it easy for any user to be productive quickly. No need for an intensive training. - Each area uses different color schema to make working with the software more enjoyable.